The densest galaxy in the local Universe may have been found. Extremely compact galaxies, known as ultra-compact dwarf galaxies, were first discovered in the late 90‘s. 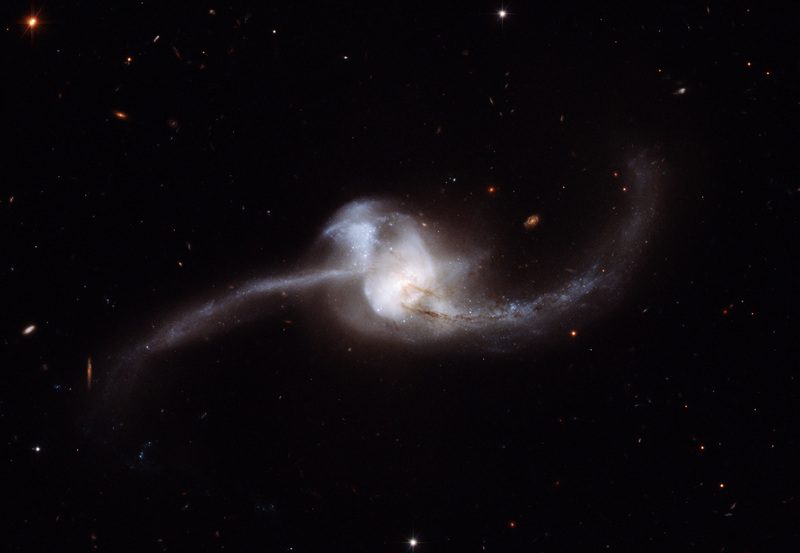 These galaxies are thought to be on the order of 200 light years across while containing about 100 million stars. Surprisingly they are far from rare, having been discovered in Virgo cluster, Fornax cluster, Coma cluster, and others. But their formation is unclear. It’s thought that ultra-compact galaxies are either massive globular clusters or the cores of elliptical galaxies that have been stripped of gas and outlying stars by tidal interactions. It’s likely that they’re actually both with the least-massive ultra-compact galaxies being massive globular clusters and the most massive ultra-compact galaxies being the cores of elliptical galaxies. Strader et al. 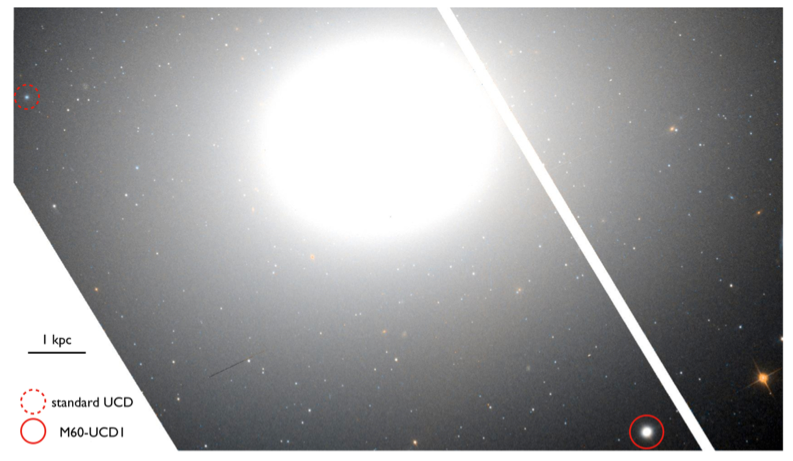 report on the discovery of an extraordinary ultra-compact galaxy around the Virgo elliptical galaxy M60, known as M60-UCD1. Figure 1 – HST color image of the central region of M60, showing the location of M60-UCD1 in the solid circle and a typical ultra-compact galaxy in the dashed circle. Image Credit: Strader et al. M60-UCD1 was discovered in 2012 with the Hubble Space Telescope. No mention of the object is made in previous Virgo surveys. In the Sloan Digital Sky Survey is was classified as a background galaxy. Follow-up observations were done with the Keck Observatory in Hawaii, where a 1200 l/mm grating centered at 7800 Angstroms observed the object for an hour and a half in sub-arcsecond seeing. The velocity dispersion derived from the spectra allowed Strader et al. to decipher a mass for M60-UCD1 using the virial theorem – a relationship between the potential and kinetic energy of the system. Once we measure velocity, we know the kinetic energy of the system, and can then solve for the potential energy in order to determine the mass of the system. M60-UCD1 is 200 million times as massive as the Sun and is packed into a region that is 80 light years across – meaning that the density of stars is about 15,000 times greater than that found in our nearby neighborhood in the Milky Way. In other words, stars are approximately 25 times closer. So this object is dense – but is it a massive globular cluster or a core of an elliptical galaxy? In order to answer this question, Strader et al. measured the object’s metallicity and searched for an X-ray source. Figure 2 – Surface luminosity density vs. luminosity. This object is by no means the densest object. It is much less dense then a globular cluster. But if it is a galaxy, as the authors argue, then it is certainly the densest galaxy yet discovered. Image credit: Strader et al. The 6.5 Multiple Mirror Telescope in Arizona was used to study M60-UCD1’s metallicity. The abundances for carbon, oxygen, and helium elements appear very similar to the mean value for local early-type galaxies. However, the abundance of nitrogen is comparable to the average value observed in globular clusters. The Chandra data also reveal the presence of a bright X-ray source. In the paper, Strader states: “There are two reasonable possibilities for this X-ray source: it could either be an active galactic nucleus associated with a massive black hole or a low-mass X-ray binary.” However, the odds of finding a low-mass x-ray binary in such a metal-poor system are less than 25%. In the case that this bright X-ray source is a black hole, the observed X-ray luminosity would be consistent with a 100 million solar mass black hole. 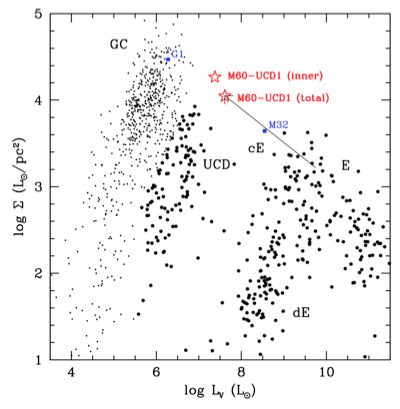 M60-UCD1 is most likely a tidally-stripped remnant of a more massive progenitor galaxy. Strader et al. predicts that the progenitor of M60-UCD1 was ~ 50-200 times more massive, suggesting that it was once an elliptical galaxy that has been stripped of most of its mass.